Sailing from/to one of the most beautiful beaches in Thailand doesn’t seem like a bad idea, right? Pattaya Beach is Koh Lipe's main beach as well as Koh Lipe’s main pick-up and drop off point. The beach is blessed with delicate white sands and gorgeous crystal clear blue waters. It is the closest beach to the island center (Walking Street), located along the south of Koh Lipe. Once you arrive, the local sea gypsies will be there to take you to the shore with their exquisite longtail boats for 20 Baht. Please note that this price is not included in your ticket. 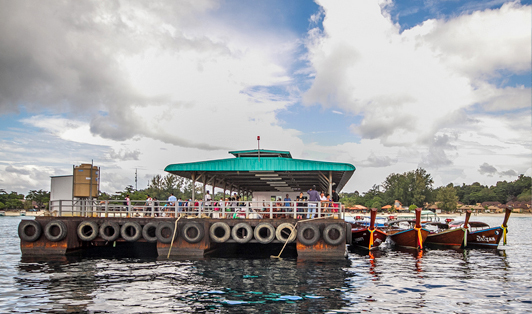 If you are departing from the beach, longtail boats will also be there to transport you to your awaited ferry/speedboat.